My son loves trains so I decided to make a train cake for his third birthday. I took some ideas from this site and added my own. I used mini loaf pans for the cars and then iced them. 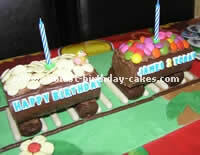 Each car had a different theme and was decorated with different candies. The wheels are mini Oreos with M&M’s on them. The tracks are just black licorice. This cake was a hit with both the kids and the parents. 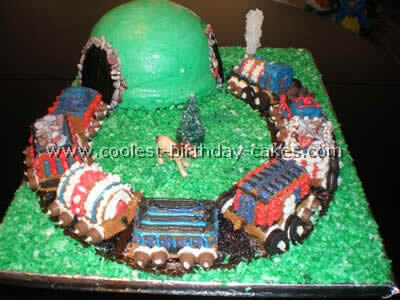 I got the idea to make this train cake from this website! It is made with Sara Lee Pound cake and Wilton icing. I used pretzels (for the cage), marshmallow (for the smoke stack), black licoriceand chocolate wafers (for the train tracks). It was very easy. I had to freeze the cake because my son got sick and I had to cancel his birthday party. To freeze it properly I put it in the freezer uncovered for 24hours. 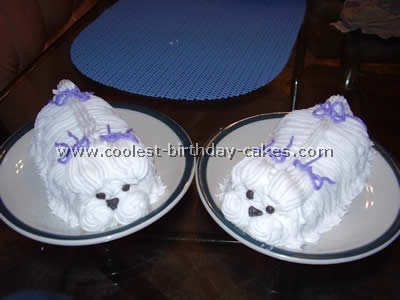 Then once the icing was completely frozen I covered it with a layer of plastic wrap and then a layer of aluminum foil. The day we were to celebrate I simply unwrapped it and let it thaw. It tasted great! Good Luck! And thanks to this website for the idea! 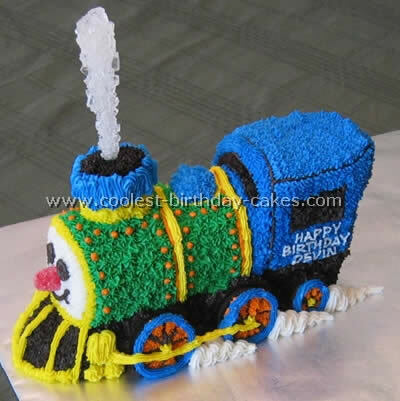 I wanted to share this train cake idea with all of you who are inspired by the fabulous cakes on this site but still don’t feel up to the challenge of making your own cake from scratch! I took the train idea and recipe from one of Annabel Karmel’s books then themed it to match our son’s Jungle Train party! The carriages were spread with chocolate butter icing to hold everything on and then sprinkled with white chocolate buttons and smarties although you could use anything your child likes! The engine and carriages are made from shop bought Cadbury Swiss rolls cut to size and balanced on mini rolls. The train track is white chocolate fingers and orange matchmakers. The wheels on the engine are party rings (she uses Jammy dodgers in her original idea). The chimney is a marshmallow tea cake with a Rolo sweet and a white chocolate button on top. The flowers were made from colored mini marshmallows stuck together with butter icing and a smartie in the middle for the pollen bit. I decorated the board and made the monkey, bird and leaves from sugar paste which was actually the hardest bit! The train cake takes a bit of time and patience to put together but everyone loved it especially my little boy! This train cake was a blast and easy too I must say! My son Peter loves trains (choo choo’s) so I thought I would make a train cake for his second birthday. I got all my ideas from this website so thanks! 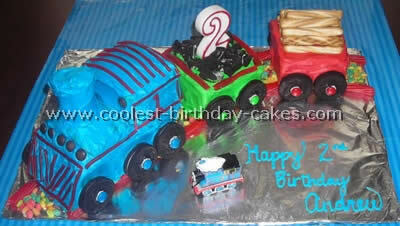 This train cake was made using the choo-choo train pan from Wiltons. I made it using pound cake so that it would stand up and do well with all the icing. In actuality there isn’t a lot of icing on the cake – just size #16 – #18 stars over most of the cake. I cheated and used Oreos and peanut butter cups for the wheels and then decorated them. Because this pushed the wheels out from the cake I had to use a toothpick to put the icing on that attaches the wheels. I also had to use marshmallows behind the steam to create depth and to give the icing something to stick to. As an after thought I added a coal car (using miniature Oreos for coal) made of angel food cake. Doesn’t hold up well to decorating but we have a number of diabetic family members who were then able to eat the cake (after removing the Oreos and candy). I used rock candy for the steam. 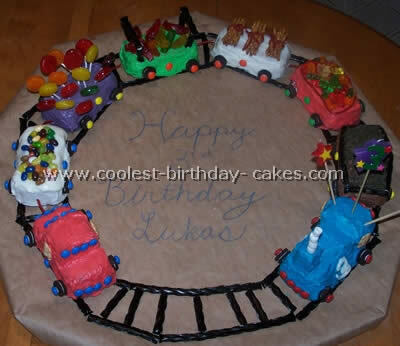 This train cake was made using a train pan from Williams Sonoma. I made the vanilla cake recipe that was included with the pan. Decided this wasn’t a good idea as the cake was too moist though absolutely delicious. This cake required a stronger recipe to hold up to a lot of decoration including the rock candy steam. Each piece of the train is small so each child got to eat a car (about the size of a cupcake). I made this train cake for my son’s fourth birthday. Virtually every part of the cake was edible. I used bread pans to make each car. The tracks were a combination of Graham cracker crumbs and Kit Kat’s. The wheels are Reese’s peanut butter cups. I used whoppers and M&M’s to fill the cargo cars. The cup cakes were shrubs. The entire process took approximately five hours. The only portion of the scene that was not edible was the cardboard under each individual car. Our son wanted a train cake for his third birthday. My husband and I brainstormed and came up with this idea. I baked four or five loaf shaped pound cakes, one for the animal car and the rest for the train. We leveled the layers and "glued" them together with frosting then my husband carved the train. The smokestack is two marshmallows dipped in green tinted white chocolate. The animal car bars are black licorice with lollipop sticks stuck inside to hold the roof up. The animals are animal cookies. The big deal for us is that the kids help with the whole process and that makes it a great family project. Using this site for ideas for a train cake I used Sara Lee pound cake to sculpt the shape of the train adding a baby food jar for the front of the engine. I frosted the entire thing using canned frosting and then colored fondant icing for the outer layer. I used simple tubes of icing for the outlines, finger cookies, small round chocolate cookies and ju-jubes for the final touches securing them to the fondant with frosting. The pound cake was nice as it wasn’t too sweet, offsetting the sweetness of the fondant + frosting. My son loved it for his third birthday party and he and his friend could hardly keep their fingers out of it! I made this train cake for a friend’s little girl who is crazy about trains. I purchased the train mold pan from Williams Sonoma. The type of cake I baked was a pound cake. I used the same recipe from a book called Whimsical Bake house. Everything was edible except for the plastic animals. The rocks were made of chocolate and were purchased from a candy store. It was fun but took one full day to make. 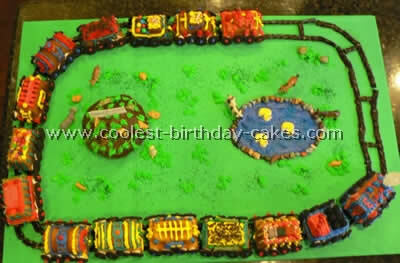 My son Monty loves trains and I love to bake him sculptured birthday cakes so of course I made him a train cake. My mother in law bought me the Williams Sonoma train cupcakes mold (makes nine different cars) last Christmas and my mom had bought me the Betty Crocker bake-and-fill cake mold set the Christmas before. The Betty Crocker set allows you to make a dome or a regular cake mold and you can fill it with ice cream mousse or just cake with icing. Of course being the ice cream and ice cream cake lover that I am I had the idea to have an ice cream cake mountain and a train going around it. My husband thought it would be cool to draw tunnels instead. So after much thought on how to have this big scene and keep my ice cream cake frozen until serving time (since we don’t have a big freezer) I decided to set everything on the cutting board. Using a devils food cake recipe from my Over 350 Desserts book I made the chocolate mountain from scratch on a Thursday night covered it and put it in the fridge. On Friday I used a pint of Haagen Dasz ice cream (half strawberry, half vanilla) and filled in the cake, set the base on top and put it in the freezer to set. Saturday morning I made the vanilla train cake cars (using half the recipe) provided with the train mold. 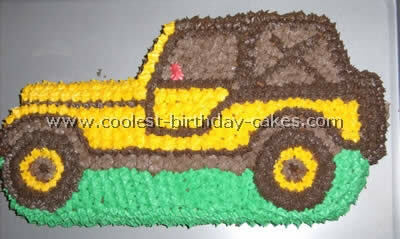 The entire recipe makes 18 cars (this batter really rises, keep the batter low in the center of the mold). My buttercream icing was made the Wednesday night before and split into different bowls for different colors. I set out the green while making my train cars so that I could begin icing the mountain that was now set. Time is limited to about a 1/2 hour when icing an ice cream cake before it will begin to melt. After the green was done I used black icing and chocolate rocks for the tunnels (found at the candy store). Set back in the freezer until Sunday. Next I covered the board in foil and laid the tracks. Chocolate Twizzlers cut in half lengthwise made the rails and uncut ones were used for the middle track. They were set down with honey. I used black and brown colored sugar for dirt between the tracks and died coconut green for the grass. All was held down with honey which makes great edible glue. We decorated the cakes with small star and round tips then set on the track and added the mini Oreos and Reese’s peanut butter cup chips for wheels. Chocolate chips where used for coal and a rock candy sucker for the smoke. The plastic horse, pine tree, candle and number three candle were the only parts you could not eat on this train cake. An half an hour before singing I took the mountain out of the freezer and carefully slid it off of the backside of a plate holding the tiny piece of foil that stuck out from underneath it onto the board. I had saved extra coconut and icing to cover any foil showing and only had to use a little coconut. My son loved it and was even clapping when we were decorating it the day before. The train cake was a big hit everyone loved the taste as well as the decorating. 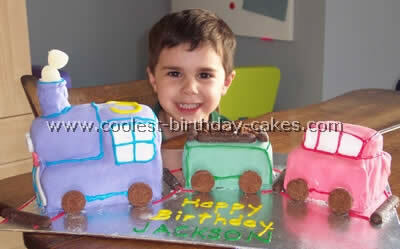 I had so much fun making this train cake for my son Andrew’s second birthday! Here is how I did it: three frozen pound cakes, two cans vanilla frosting (I split one for two cars and one for the engine), gel food coloring tubes, "writing icing", pens toothpicks and one plastic straw, m&ms, Oreos, pull and peel Twizzlers, pretzels rods, fruity cereal, foil, cardboard, side of a diaper box cut of course. Start with one loaf and make engine by cutting a diagonal off the front end then take another loaf and cut in half. You will have two cars then to build your engine take the third loaf and cut a third of it off roughly to have your engine top. Place it on the back end of your engine to get the rounded effect underneath the smokestack trim off the tops of both cars and use one of them placing it on the front of the engine. Toothpicks will keep the sides from rising up. For the smokestack take an Oreo, place it on top of the rest of your third loaf and using the cookie as your guide cut a square out of the cake, a little larger than the Oreo then take that square out and trim the square into a smokestack by rotating it clockwise little by little and if you tilt the cake ever so slightly while you cut you get the graduated larger to smaller effect. Now place on top of the front of your engine and put a straw down the middle of it to help keep it in place while you frost the traincake. Split one can of frosting for each car and use one whole can for the engine. Mix up your colors using a whole tube of coloring for each. I used the side of a diaper box (one of the Sam’s club bigger boxes) to put my cake on and put foil over it and voila a "cake plate". It was something I already had and didn’t have to buy! I built the tracks with whole Twizzlers and poured cereal inside for color. I frosted each cake and then placed it on the track one by one. Put the wheels on and connected each car with Twizzlers I cut. I crumbled Oreos for coal and used pretzel rods for logs. I trimmed the coal car with Twizzlers. I pulled apart the Twizzlers to make the piping on the engine and the number one on the side. I used brown M&M’s for the front of the engine. I stuck a number two candle in the middle and put a toothpick behind it to keep it from falling. Don’t forget about your straw and your toothpicks when you go to cut it! I say this because I kept my straw in there while I put the frosting on and then trimmed it off with scissors just even with the top so that it would not fall over and forgot about it! We decorated cupcakes with the leftover candy! I had so much fun with this train cake! It was a blast and my son and all of his friends loved it!